What boring new car do you recommend to your friends? Like many car lovers, when my non automotive obsessed friends are in search of car purchasing advice, I am usually the first one to get a call. After they listen to my standard automotive advice (Don't buy a '57 Plymouth) my friends usually ask me to point them in the right direction towards a new and what I would consider boring car. Although I've never really owned a car that really fits the "new reliable and boring" description, I can usually come up with a few suggestions that point them in the right direction. This weekend we want to know what happens when your non automotive obsessed friends ask you the same question. What boring new car do you recommend to your friends? 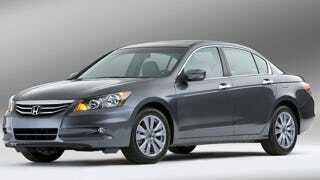 My go to boring new car recommendation is a Honda Accord. I've never owned one, but generally speaking the people I know who have them are happy with them. I've driven one with a stick before and it wasn't as intolerable as I made it out to be in my head. If someone held a gun to my head and forced me to make a rational new car buying decision, I'd probably go for an Accord with a V6 and a stick, I think. I've told you about the boring new vehicle I suggest, so tell me, what boring new car do you recommend to your friends?